A research team from the U.S. Department of Energy's Lawrence Berkeley National Laboratory (Berkeley Lab) came to this conclusion after evaluating observations of Jupiter and Titan (a moon of Saturn), where methane concentrations are more than a thousand times those on Earth, to quantify methane's shortwave radiative effects here on Earth. These findings were published online today in the journal Science Advances in an article entitled "Large Regional Shortwave Forcing by Anthropogenic Methane Informed by Jovian Observations." The paper indicates large regional variability in the ways methane acts as a solar absorber, finding that methane absorption, or "radiative forcing," is largely dependent on bright surface features and clouds. "When we measure the impact of methane emissions on the planet, we wrongly assume it is easy to apply calculations of methane taken locally to predict what effect the gas is having globally," said William Collins, the study's lead author and director of the Climate and Ecosystems Sciences Division at Berkeley Lab. "Our work represents the importance of taking into consideration what impact methane and other greenhouse gases are having not just in general, but with regional certainty." As greenhouse gases, carbon dioxide and methane primarily absorb heat, or longwave radiation, emitted to space by the Earth's atmosphere. However, methane and other gases also absorb incoming solar energy, or shortwave radiation, and convert it to heat, thereby warming the atmosphere by an additional 25 percent while simultaneously cooling Earth's surface. More is known about shortwave forcing by carbon dioxide than methane, largely because the relatively complex tetrahedral shape of methane makes its physical absorption characteristics extremely difficult to quantify in the laboratory. The Berkeley Lab research team set out to assess whether previous climate assessments had suffered from uncertainties in calculations of anthropogenic shortwave forcing by methane, widely considered to be the second-most important greenhouse gas after the more abundant carbon dioxide due to methane's extreme potency. The scientists analyzed methane absorption data from previous observations of the planet Jupiter, and Titan, the largest moon of Saturn. Concentrations of methane in the atmospheres of this Jovian planet and moon are at least three orders of magnitude greater than those on Earth, making it easy to detect absorption properties of methane using occultation measurements. This analysis showed that estimates of the forcing using the incomplete methane absorption data from Earthbound laboratories agree with estimates using the far more comprehensive methane absorption data collected from Jupiter and Titan. Based on this finding, the current spectroscopy is sufficient for calculating methane radiative forcing in historic climate analyses and future projections. Their work also lays to rest a previously unsettled issue that climate models might be underestimating the shortwave radiative effects of methane due to limitations of existing laboratory measurements of this gas. The measurements from Jupiter and Titan show it is possible to accurately calculate the extent of radiative forcing by methane in climate assessments, and that current climate models have been doing so. The result then enabled the team to use existing capabilities to undertake the first global spatially-resolved calculations of this forcing with realistic atmospheric and boundary conditions. They advanced beyond the existing global annual-mean estimate of methane forcing by resolving its seasonal and appreciable spatial variability. Their analysis showed that methane forcing is not spatially uniform whatsoever, and exhibits remarkable regional patterns. The most striking finding from the first comprehensive calculations of methane forcing is that because desert regions at low latitudes feature bright, exposed surfaces that reflect light upwards to enhance the absorptive properties of methane, there can be a 10-fold increase in the localized methane shortwave forcing. This effect is most pronounced in locations such as the Saharan Desert or Arabian Peninsula. These regions receive the most sunlight due to their proximity to the equator and feature exceptionally low relative humidity, which helps to further enhance the effects of methane. Cloud cover was also shown to influence the gas' radiative effects. 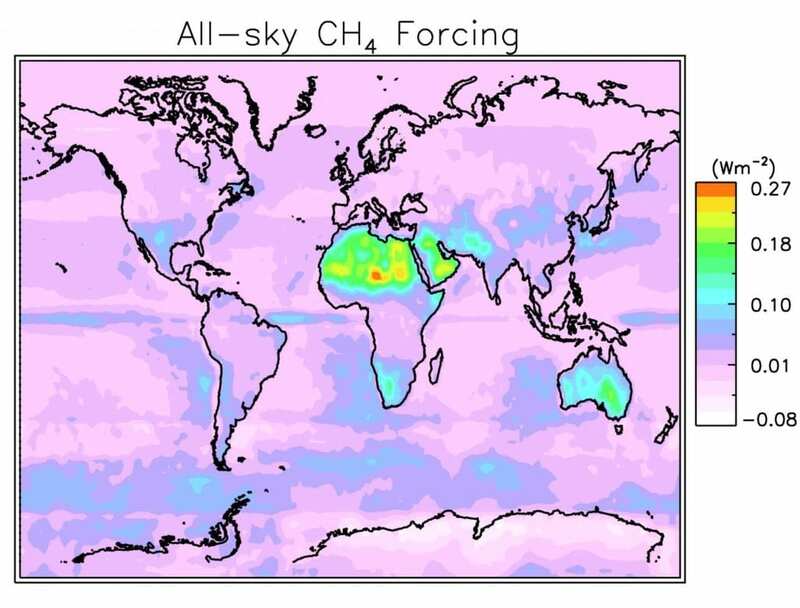 Increased forcing for methane overlying clouds was found to be up to nearly three times greater than global annualized forcing, and were associated with the oceanic stratus cloud decks west of southern Africa and North and South America and with the cloud systems in the Intertropical Convergence Zone near the equator. High-altitude clouds can reduce the solar flux incident on methane in the lower troposphere, reducing its forcing relative to clear-sky conditions, but over nearly 90 percent of the Earth's surface, cloud radiative effects enhance methane radiative forcing. The researchers believe this information about the effect of methane on incoming solar energy is useful to advancing climate change mitigation strategies both for taking into account the relative strength in the greenhouse effect between carbon dioxide and methane and for determining the relative vulnerability of different regions across the world to atmospheric warming. Study co-authors are Berkeley Lab researchers Daniel Feldman, Chaincy Kuo, and Newton Nguyen; Nguyen is now at the California Institute of Technology. The study was funded by DOE's Office of Science.